Throughout the week, CNH offers a variety of programs for families. For more information on the following programs, please contact 604-435-0323. A wonderful program for parents and caregivers of children newborn to 6 years old. They can meet others while enjoying a cup of coffee and conversation. There are arts and crafts for the children plus story time, circle time, and many fun toys to play with. This program is for parents who have children 5 years old or younger. Parents learn about caring for children and effective parenting skills during several weekly sessions. Groups operate in different languages twice a year and childminding is provided. We announce on the website when we are accepting registrations for a program. Pre-registration is required for this program. For details, call Satinder at 604-435-0323 ext. 241. Cost: Free. This program is for parents, grandparents, and caregivers of children from 0 – 6 years old. The focus is on the health and well-being of young children, their families, and the relationship of families to their community. Children and parents make new friends. Parents share resources, parenting skills, and child-minding and also learn positive ways to support each other. Every Monday evening a delicious dinner is cooked by parents and youth and served to Families Branching Out members. The setting is informal and childminding and recreation activities are provided. All parents/caregivers are expected to help with food preparation, clean-up, craft activities, etc. Dinner preparation begins at 1:30 pm; children’s drop-in/childminding program is from 4:45 to 8:15 pm and supervised gym time is from 7 – 8 pm for older siblings; and dinner is served at 6 pm. Activities vary and include informal planning meetings, workshops and guest speakers, and traditional arts and crafts activities. There are many celebrations throughout the year, such as Thanksgiving, Valentine’s Day, Christmas, Aboriginal Day, Halloween, Lunar New Year, Mother’s Day, and Father’s Day. Come and join us! An aboriginal driven program for children from 0-6 years old and their extended family. 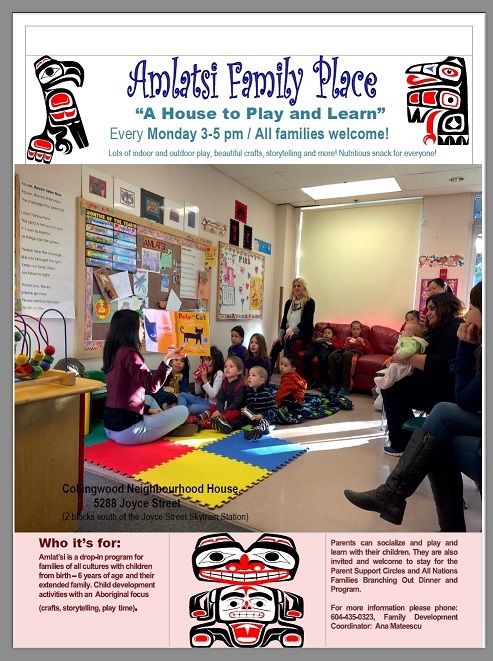 Program includes child development activities with an aboriginal focus, crafts, story-telling, and lots of play. Light snack included. We welcome everyone, especially young parents, to join us in a friendly, creative, comfortable and supportive place. An Aboriginal Family Support Worker attends the program. Families are encouraged to stay for the Families Branching Out Monday dinner. The family sharing circles are facilitated in a way that supports and empowers parents to use traditional and holistic teachings with their families. Parents can feel safe sharing ideas and will learn positive parenting skills and connect more to the community and the resources available to them. Call 604-435-0323 for more information.